Dave was once again concerned that we see the monuments of Rajasthan so after a breakfast of banana-honey pancakes, we headed off to the Amber Fort. This was actually one of my favorite stops of our entire trip. Nestled in the hills outside of Jaipur, the Amber Fort over looks a valley. I was dying to take a look inside but quite tired of overpaying for the pleasure of simply looking at a building. I noticed as I was standing in line for the entry ticket that there was a student price. So, I whipped out my good old Baylor ID card. After being scrutinized for a few minutes, I apparently passed for a college student and paid half-price admission (which was still well more than tripple the national ticket price). Tricking the system made this experience slightly more enjoyable than our previous ones. We stopped by the Water Palace before heading to a textile factory. Shopping is my weakness and once again, I found myself with so much fabric I didn't know what to do. I look forward to sewing it all into something fabulous when I get home this summer! After eating lunch at a restaurant (which employed someone to wipe the toilet seat before you entered the restroom), we headed back to New Delhi. Luckily, we had all enjoyed riding in the car up to this point because this portion of our trip took nearly 6 hours! Albeit, we stopped for gas and a drug fix (for Dave, not us) and changed a flat tire. This particular flat tire was quite amusing, although without knowing Dave, it's probably just one of those had to be there kind of things. Dave suddenly jerked to the shoulder of the road when we were about an hour away from the city. After casually sticking his head out the window, he turned around to us and announced in the most monotonous voice you could possibly immagine "Tire is flat". It took us a moment to gain composure and stop giggling. After emerging from the car, we tried to capture a bit of the humorous moment on camera, as Dave unloaded our belongings and stacked them on the roof of the car. We failed. Originally, we had planned to stay in Agra for two days but seeing as how we saw the Taj Mahal in one morning, we decided to change our plans and take a detour to Jaipur. We saw some pretty interesting things, but I think my favorite part of the trip was simply riding in the car and seeing the countryside. As with anywhere, the smaller towns were dramatically different from the large cities. The drive to Jaipur was several hours and about halfway there, Dave asked if we would like to see a temple. In the spirit of being adventurous, we agreed. He pulled off the highway onto a small, two-lane road where we promptly came upon a herd of sheep. Once Dave had honked the horn numerous times, we passed the herd on the side of the road....only to come upon another herd about half a mile up. Then another. Then another. Dave explained that these were real life nomads. Literally. Wandering the Indian countryside with little more than their herds. I don't know about you, but when I think of nomads, I think of people back in Biblical times, not 2012. It was interesting to see that this was still a way of life for so many people. We arrived at the temple a few minutes later. This temple was rather different from any other that I've seen anywhere in the world, in that it was built down and into the rock, rather than up towards the sky. It went about two stories into the ground, down behind us, in order to collect rain water. We headed back to the highway and passed the herds of sheep, again. After another couple hours, we arrived in Jaipur. We checked into our home stay then headed into town. Dave dropped us off at the City Palace Museum, which turned out to be a tourist trap. 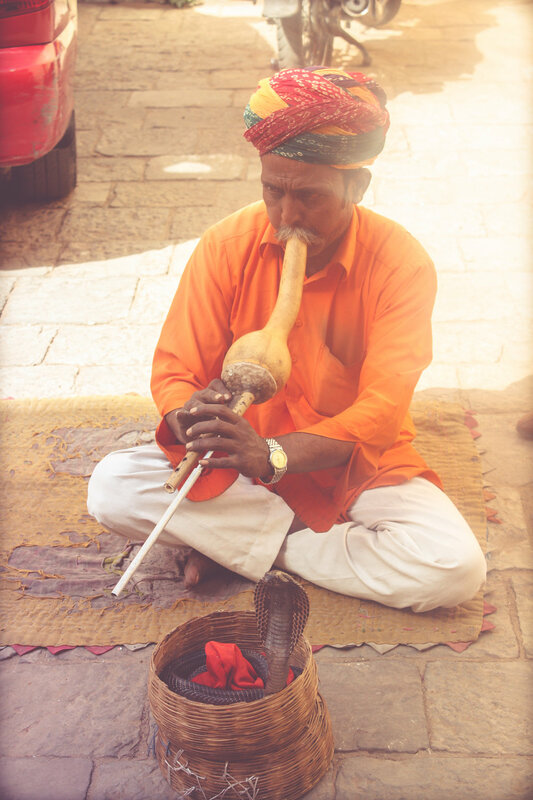 The only upside to this stop was getting to see a...snake charmer! After taking pictures of him, I was persuaded to join him on his carpet for a photo. I don't know how he managed to do it because I was sitting quite far away and staring quite intently at his basket but somehow, he signaled to the snake to lunge at me. I absolutely cannot stand snakes and proceeded to scream bloody murder. The charmer insisted that his snake was "safe". We spent the rest of the afternoon shopping. Nothing can compare to the determination of the shopkeepers in India. Long story short, I had had my eye on this patchwork quilt with elephants on it. I approached the first shop I came to that had one displayed. For those of you who have visited Canal Street in New York, you have probably been led down a dark alley to a secret room that's behind a wall. It was a similar case at this particular shop and we were led into a basement that was no larger than the size of a jail cell. After about 20 minutes of haggling, I could tell he wasn't going to go any lower. We high-tailed it out of there and stopped in the next shop with the quilts. While I was making my purchase, the first shopkeeper is furiously pounding down the street, seemingly in search of us. Glad we doged that bullet. Senior year of high school, my family took a trip to Rome. Having taken Latin for four years, I was pretty excited to see the places that I had learned about for so long. The ruins were just as I had imagined they would be, but the historical ambiance was slightly overshadowed by the onslaught of shutter-happy tourists around every colonnaded corner. This, however, was not the case for our next stop in India. After we finished at the Taj, it was only about 1pm. 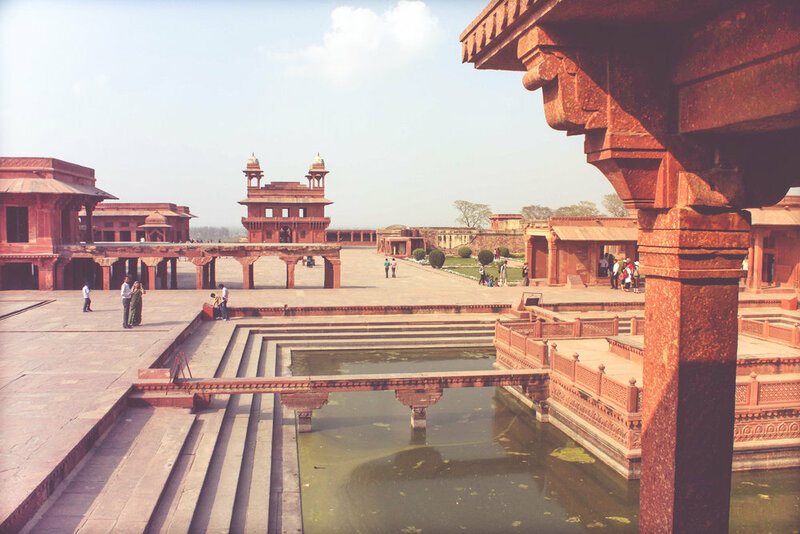 We convinced Dave to take us to a ghost town called Fatehpur Sikri. 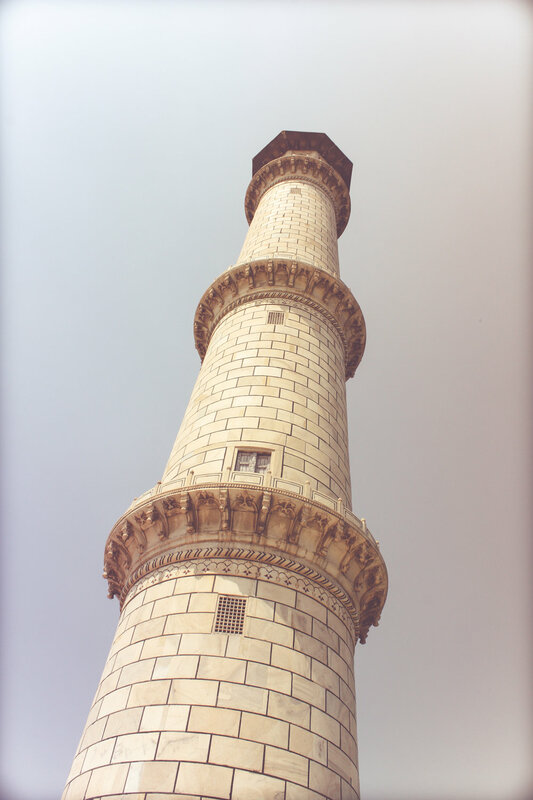 It was about an hour drive from Agra. According to what I read about it, there were two different towns, Fatehpur and Sikri. Since we didn't pay for a "guide", I'm a little fuzzy on the rest of the history of the place. It was, however, worth the visit. Well preserved and open for exploring, it was the perfect end to our hectic morning. We woke up at the crack of dawn to head to Agra, home of the Taj Mahal. We had originally planned on taking the train (Darjeeling Ltd anyone?) but unfortunately, without possessing an Indian phone number, it was quite impossible to buy tickets. Dave was a trooper but didn't seem too happy to be up that early either. Our first day together, Dave seemed pretty quiet. About an hour outside of Delhi, we figured out that he did indeed like to talk...about his religion. Dave is Sikh. It was a rather interesting conversation. He wasn't trying to convert us, he just seemed like he wanted us to be educated. He told us how Sikhism is similar and at the same time quite different from Hinduism. He also told us the stories of all of his gods and how he also believed in the Hindu gods. His story came to a climax when he pulled off the road so we could see a shrine. It was quite a large shrine for being in the middle of nowhere! Almost five hours after our departure, we arrived in Agra and went straight to the ticket booth for the Taj Mahal. Again, we paid an outrageous ticket price but were pleasantly surprised when the transportation from the ticket office to the entrance was free! We paused for a cup of coffee before heading to the compound. There was a separate security line for men and women because despite walking through a metal detector, everyone was patted down, which seems to be a trend in Asia. Of course the sheer size, as well as the ammount of white marble is incredible but what astounded me was the symmetry of the entire compound. From the gardens right down to the inner room, everything mirrors its counterpart. The interesting thing, was that the Taj was designed for his deceased wife. When he died, it was decided that he should be burried with her, however, the construction had not accounted for a second casket during construction. In the inner room, the wife's casket lies right at the center, under the dome, while her husband lies to the left, asymmetrically. We met up with our driver for the duration of the trip. We never actually figured out his real name but he told us to call him Dave. We started out the day by going to a monument, because Dave seemed rather perplexed that we had spent the majority of our first day shopping, not sightseeing. He dropped us at Humayun's Tomb. Again, I don't really know the exact history of the thing but it was elaborate and beautiful. The grounds were as magnificent and peaceful as the building itself. From there, we went to see another monument, which we of course knew nothing about and turned out to be closed anyways. This is the Lotus Temple, aka the Baha'i house of worship. After appeasing his desire for us to see the monuments of India, Dave conceded and took us to what I refer to as Aladdin's Cave of Treasures. We were promptly picked up by a salesman when we walked in who led us to the scarves. Buying textiles in India is like having a personal shopper. You get seated on a couch while the salesperson stands on a platform and presents items to you of all different qualities (money). From the scarves, we were led to the punjabis (tunic shirts), purses, bedspreads, custom fabric and collectibles. It's a good thing we weren't on a schedule because a good hour had passed by the time we actually made our purchases! After our shopping excursion, Dave took us to Connaught Place which I had read contained some pretty cool specialty stores that export to the US. He dropped us off at a restaurant on a corner and told me to call him when we were finished. Unfortunately, as we sat down to lunch, I realized that I had left my phone in the car. The restaurant was amazing. I had some dry potatoes (meaning not floating in curry) that packed a crazy punch! We finished lunch and decided to walk around Connaught Place for awhile, which was quite the opposite of what I had read about before the trip. We almost felt as though we were being chased, like in a movie. Everyone stared at us while we were walking down the street and if we paused for a moment, we were assaulted with offers to lead us to the "nearest bazaar". Luckily, we were rescued by Dave, who happened to be circling around. He dropped us off at an English-language bookstore. It was at this bookstore that I had a horrifying experience with a squatty. Being that most facilities in Indonesia are squatties, I didn't think it would be a problem in India. Boy was I wrong. I asked an employee if they had a restroom I could use. He said, "Yes miss, please follow me" and proceeded to lead me out the back of the store to a small shack in the alley. I was not prepared for what I saw when I opened the door. For those of you who are unfamiliar with squatty potties, they are basically porcelain bowls set down into the ground, where you squat. Usually, they are equipped with a flusher or accompanied by a bucket that you fill up then dump into the squatty. I opened the door to the shack and was greeted by the unpleasant odor that usually accompanies a squatty. This squatty, however, did not flush. In addition, there was tobacco spit or vomit (I honestly couldn't tell) running down the wall near the mirror. After seeing what I was up against, I suddenly did not have to use the restroom anymore and made a hasty exit through the alley. Dave obliged and dropped us off at one last market before taking us back to the hotel. We went back to the Paharganj market we had visited the previous night. This time, it was bustling with backpackers who kept disappearing down small dark alleys to find their hostels (which made me all the more grateful that we had not chosen that route). 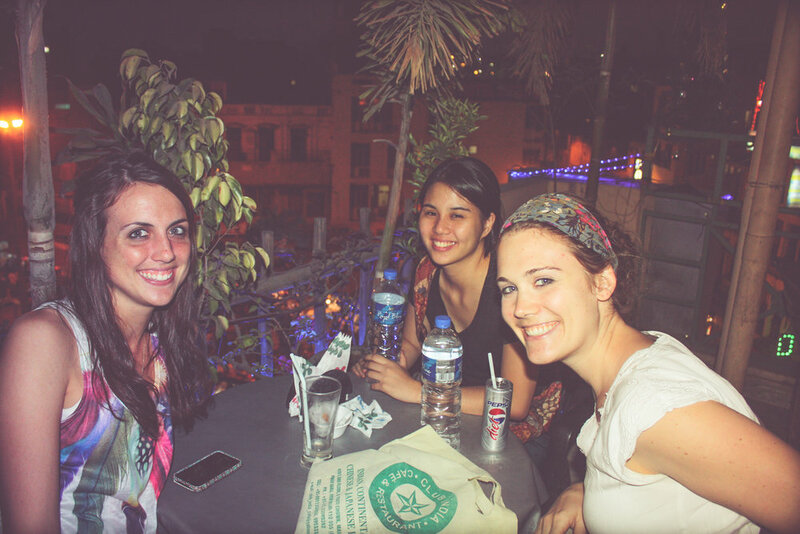 We capped off the day with a visit to a rooftop cafe in the bazaar. We got up there just as the sun was setting and there were stunning views of the market below.